Credit: Credit: ESA / XMM-Newton / L. Oskinova, University of Potsdam, Germany / M. Guerrero, Instituto de Astrofisica de Andalucia, Spain (X-ray); Cerro Tololo Inter-American Observatory / R. Gruendl & Y…. The discovery of the largest timing irregularity yet observed in a pulsar is the first confirmation that pulsars in binary systems exhibit the strange phenomenon known as a 'glitch'. The study is published in the journal Monthly Notices of the Royal Astronomical Society. Pulsars are one possible result of the final stages of evolution of massive stars. 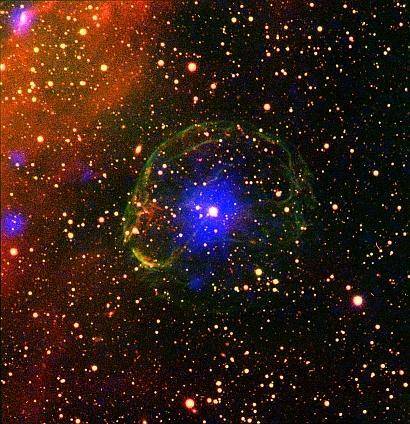 Such stars end their lives in huge supernova explosions, ejecting their stellar materials outwards into space and leaving behind an extremely dense and compact object; this could either be a white dwarf, a neutron star or a black hole. If a neutron star is left, it may have a very strong magnetic field and rotate extremely quickly, emitting a beam of light that can be observed when the beam points towards Earth, in much the same way as a lighthouse beam sweeping past an observer. To the observer on Earth, it looks as though the star is emitting pulses of light, hence the name 'pulsar'. Now a group of scientists from the Middle East Technical University and Baskent University in Turkey have discovered a sudden change in the rotation speed of the peculiar pulsar SXP 1062. These jumps in frequency, known as 'glitches', are commonly seen in isolated pulsars, but have so far never been observed in binary pulsars (pulsars orbiting with a companion white dwarf or neutron star) such as SXP 1062. SXP 1062 is located in the Small Magellanic Cloud, a satellite galaxy of our own Milky Way galaxy, and one of our nearest intergalactic neighbours at 200,000 light years away. Lead author of the study, Mr M. Mirac Serim, a senior PhD student working under the supervision of Prof Altan Baykal, said, "This pulsar is particularly interesting, since as well as orbiting its partner star as part of a binary pair, it is also still surrounded by the remnants of the supernova explosion which created it." The pulsar is thought to pull in the leftover material from the supernova explosion, feeding on it in a process known as accretion. The team believe that the size of the glitch is due to the gravitational influence of its companion star and this accretion of the surrounding remnant material, which together exert large forces on the crust of the neutron star. When these forces are no longer sustainable, a rapid change in internal structure transfers momentum to the crust, changing the rotation of the pulsar very suddenly and producing a glitch. "The fractional frequency jump observed during this glitch is the largest, and is unique to this particular pulsar", commented Dr Seyda Sahiner, a co-author of the study. "The size of the glitch indicates that the interiors of neutron stars in binary systems may be quite different to the interiors of isolated neutron stars." This work was initially presented in 2017 at the European Week of Astronomy and Space Science, which will be held next year in Liverpool jointly with the UK National Astronomy Meeting. The work will be followed up with NASA's Neutron Star Interior Composition Explorer (NICER) mission, launched in June this year – the team hope that the finding may lead to a better understanding of the interior of the neutron stars, putting new constraints on the neutron star equation of state.